Comstor, a Division of SYNNEX Corporation, is a value-added distributor of category-leading Cisco technology solutions. Combining expert technical and market knowledge, we deliver a multi-pronged EDGE (Engage, Develop, Grow and Extend) strategy to enable partners to build a profitable Cisco practice. Comstor Security Initiative (CSI), is a comprehensive development program designed to help value added resellers (VARs) build a successful Cisco Security practice. This comprehensive program provides focused consulting, best practices, education, training, tools and tactics for each reseller’s core business functions, including: executive, sales, engineering, marketing and operations. The Comstor Evolution program is designed to help value added reseller (VARs) build and grow a successful Cisco Collaboration practice. 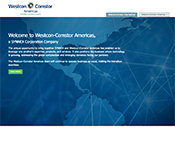 Comstor is transforming the North American channel supply chain through innovative solutions, global capabilities and business-extending services. Meet the great people striving to ensure that you experience world-class service in your day-to-day interaction with Comstor. Engaging in a new partnership can seem overwhelming. It doesn’t need to be! Let Comstor help you get up to speed with some tips and tricks you need to get started. 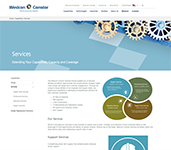 Capitalize on the future today with Comstor Federal. Comstor ERS empowers our partners to establish unique strategic executive value and go deeper and higher within organizations. Partners who use ERS build bigger pipelines and sell more at greater margin than those who do not. The Comstor Evolution program is a development program designed to help value added reseller (VARs) build and grow a successful Cisco Collaboration practice. This comprehensive program provides focused consulting, best practices, education, training, tools and tactics for each reseller's core business functions. Learn how to seamlessly, securely and profitably deliver government/federal technology solutions with Comstor by your side. Let Comstor help you navigate market complexities to grow your government business. Put our partner incentives and promotions specifically designed to increase your profitablity and customer satisfaction to work in your business.